Only one more day of Sale-a-bration left. Tomorrow starts the new Mini Catalog. There are some great new items coming up. I made it using the WildCard Cartridge from Cricut. I love how it came out. 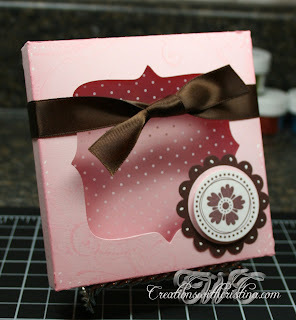 Wild Card Cricut Cartridge, Pink Pirouette Cardstock, Pink Pirouette Ink Pad, Brown Satin Ribbon, Chocolate Chip Cardstock to use with the scallop circle punch, 1-3/8 and 1-1/4 circle punch. A piece of whisper white cardstock, the Priceless stamp set and the new transparencies that will be in tomorrow's catalog.